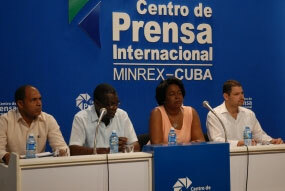 Havana, April 2 (Prensa Latina) The dialogue Cuba-US on human rights allows to gain insight into the respective positions and national realities on the subject, in which both countries have totally different perceptions, said here today a source of the Cuban Foreign Ministry. “There is a lack of knowledge, in general, about the Cuban reality and this is a mechanism that enables and facilitates a better understanding of our reality, which is completely different from that of the US,” said Pedro Luis Pedroso, Deputy Director General of Multilateral Affairs and International Law of the Cuban Ministry of Foreign Affairs. He stressed that during the dialogue, the Cuban delegation stressed the need to have this meeting on the basis of equality and non-interference in the affairs inner of the two countries, and that at the meeting topics of interest to both delegations addressed, adding that Cuba express concerns about the security and protection of human rights in the United States. Among those concerns mentioned were the existence of patterns of discrimination, racism and police abuse in that nation. He also stated, Cuba said the violations of human rights in the so-called fight against terrorism by Washington, including torture, extrajudicial executions use of drones, and violation of trade union rights in the US. The meeting confirmed that there are profound differences between the parties regarding the conception and exercise of human rights, he said. These conversations ratified that both parties can engage in a dialogue on any subject, always on the basis of respect and reciprocity, concluded Pedroso. This first Cuba-US human rights dialogue is included in the process initiated last December to restore diplomatic relations between the two countries, after half a century of rupture and unilateral US sanctions against Havana. Discussions on this issues were proposed by Cuba in July 2014, ratified in January, and accepted by the US authorities.